It is a gorgeous summer day and I spent the afternoon tidying up the garden, mowing the grass ( I daren’t use the term ‘lawn’ under the Trades Descriptions Act), clipping the hedge with some help from son 3 and harvesting veggies. 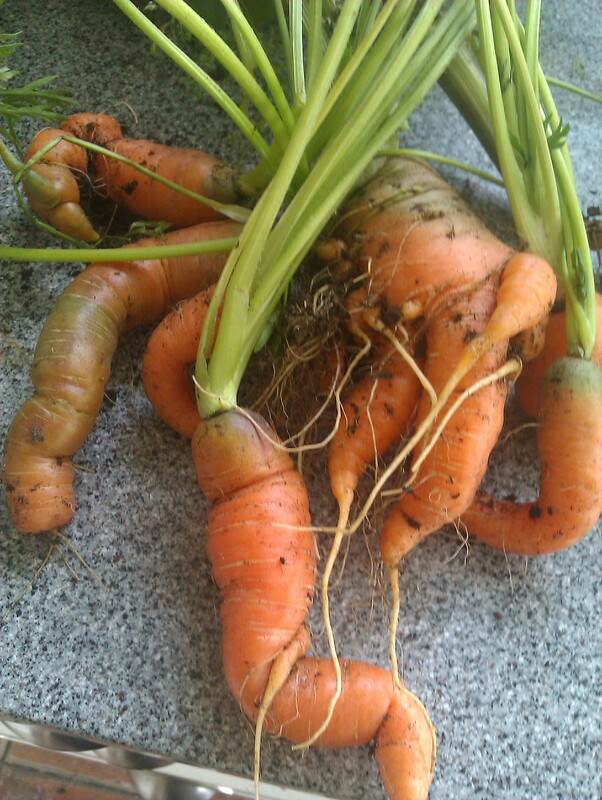 This is our first crop of carrots, all curly and feathery topped. I wish I could do a scratch and sniff post so you could inhale the carrotty scent as they came up from the ground. I squeal with excitement at every vegetable that materialises. I also picked some tiny baby beetroot. 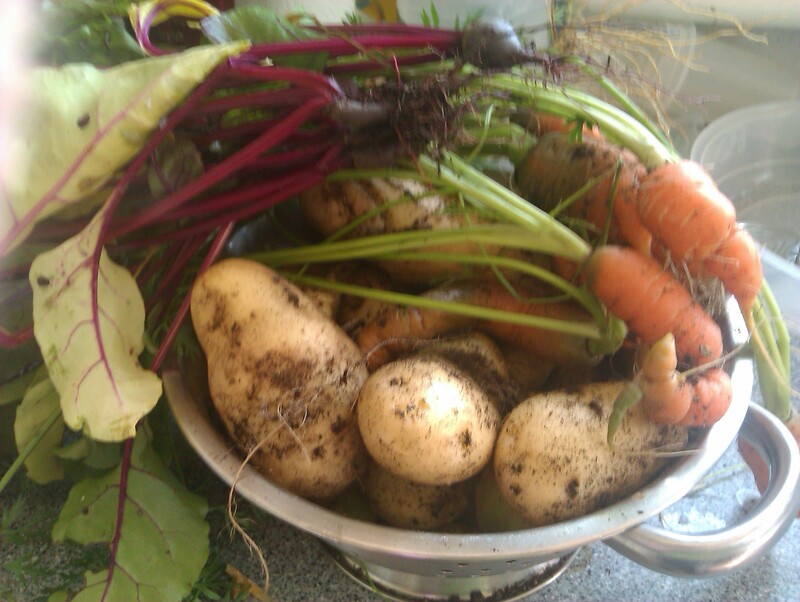 Tonight we are going to eat tuna steaks with steamed new potatoes, curly carrots and the tiny bettroots just for fun. 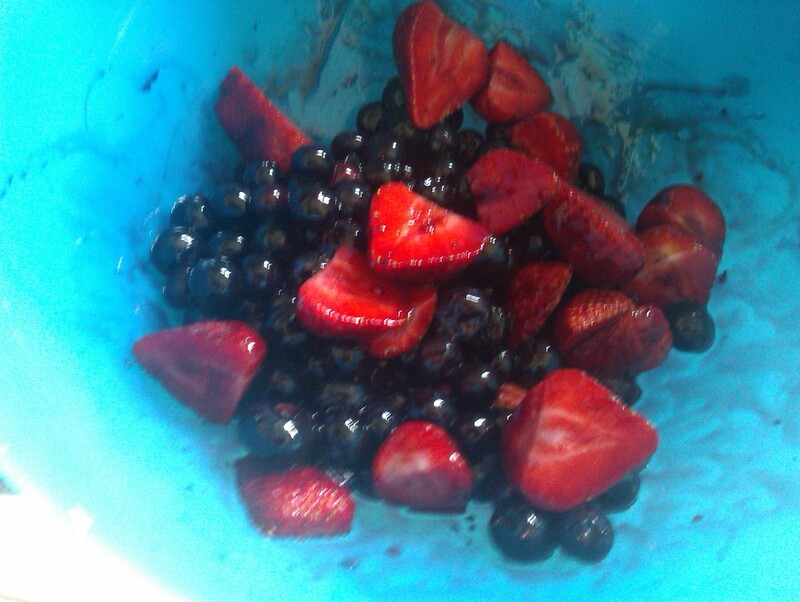 And after we are having strawberries and bluebrries which are right now marinading in a couple of spoonfuls of balsamic vinegar. Apparently they taste amazing with balsamic and fresh pepper so we will see. I didnt add the brown sugar as I know the fruit will be sweet enough for us! And psssst Im not doing sugar ( grin). Food straight from the garden feeds the soul not just the body. Good food shared in good company makes your heart sing. I am lucky, I have both. One potato, Two potato, Three Potato, Four ..
Digging up our first ever potato crop yesterday was truly like finding golden treasure. 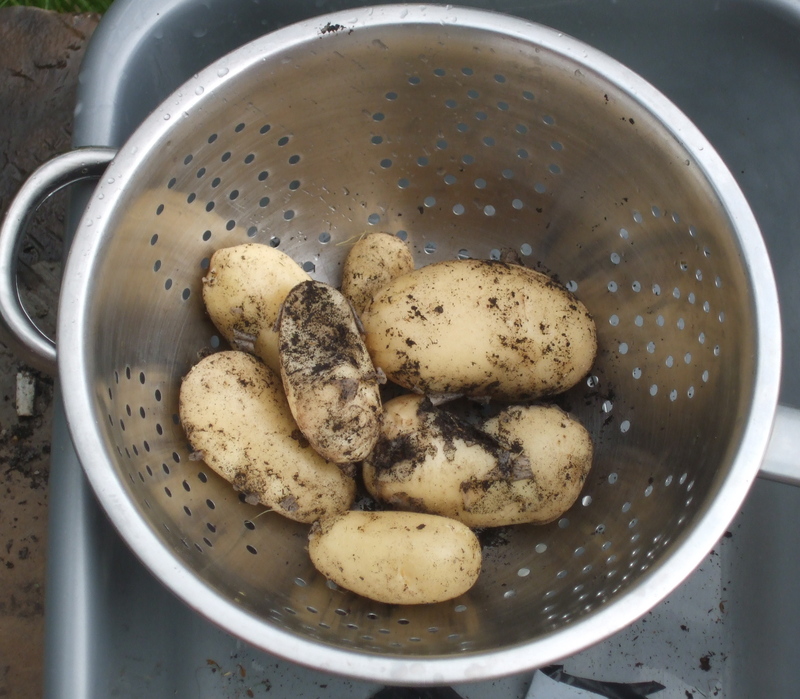 To put the fork in and turn the soli over then find a perfect new potato just made me shriek and grin! I dug up just enough for dinner for last night and we savoured every delicious, earthy, sweet mouthful. And yes, they really do taste different. We ate them with salmon, some lettuce from the garden mixed with sugar snap peas, cucumber and mint ( also from the garden). We had a large jug of iced water with lemon and mint, added butter to the potatoes. Heaven. I love potatoes.The daughter of a friend of mine, who is now in her twenties, asked Santa for a bag of potatoes ‘All for herself” when she was 7. She would have loved these! You can do so much with a potato. Boil it, mash it, fry it, make chips and fries with it, bake it, add cream and onion and garlic and Frenchify it deliciously.Make Bubble and Squeak ( potatoes and cabbage leftovers English) or Colcannon (Bacon and potato leftovers Irish), Potato Cakes ( Welsh), Champ or Tattie Scones ( Scottish).Use it in an ‘egg’ and spoon race. Play counting games with it. It must be one of the most maligned vegetables, blamed for making us fat when it is a solid satisfying complex carbohydrate which releases sloooow sugars to keep us steady between meals. 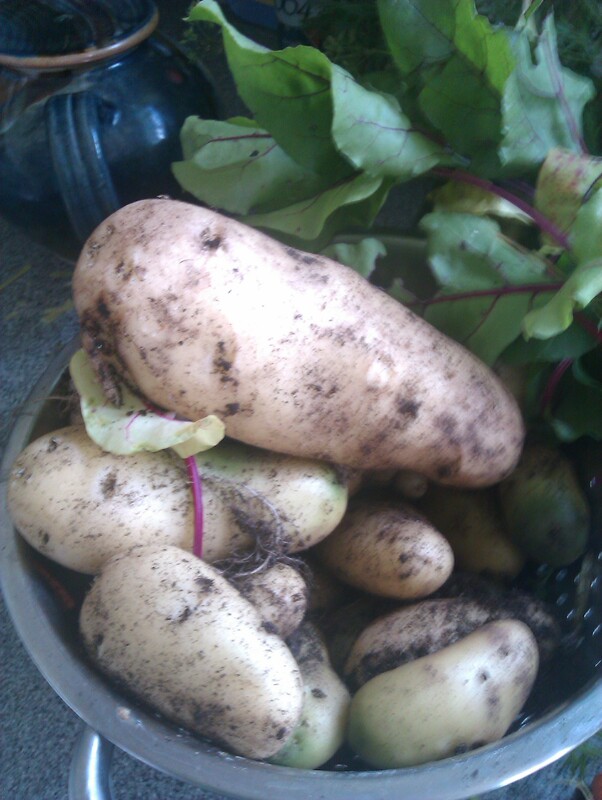 This was my first foray into potato growing, there are lots more out there just waiting to be savoured and eaten. The onions are coming on too, as are the carrots and beetroot. So, One potato, Two potato …. 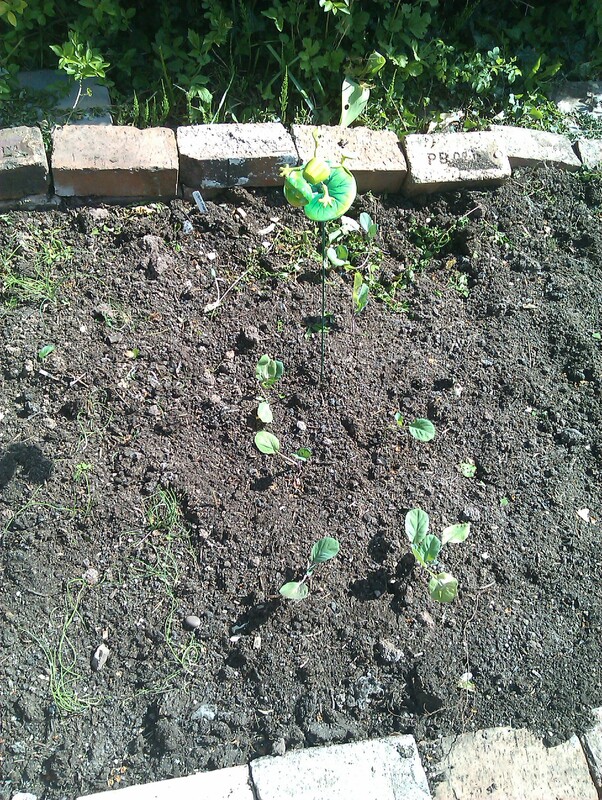 The vegetable patch is exploding with growth. 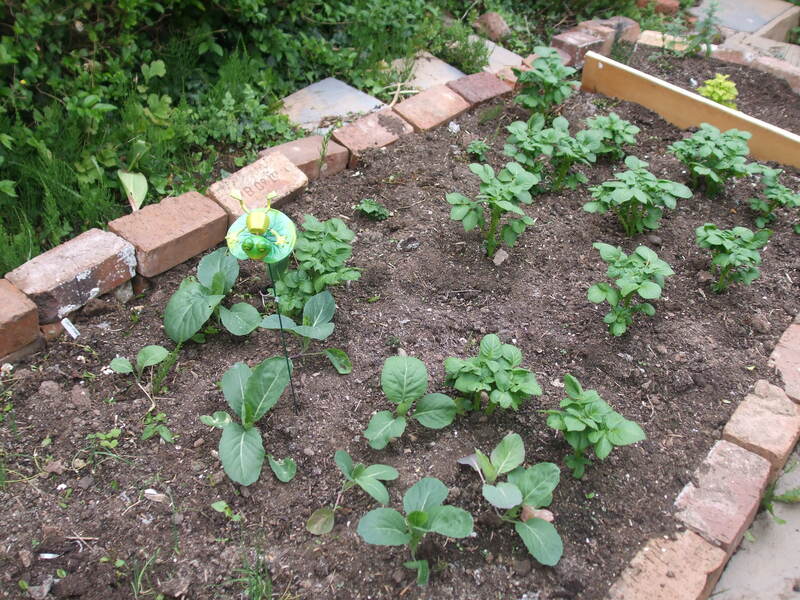 Spring cabbage and potatoes are vying for space. The carrot tops are waving like a feathery forest. Feeling tired tonight and needing a simple but ‘good for you’ meal we had fresh new potatoes with butter, chicken gently fried in some olive oil and with organic stock cubes and tarragon for flavour and a spring cabbage cut straight from the garden. 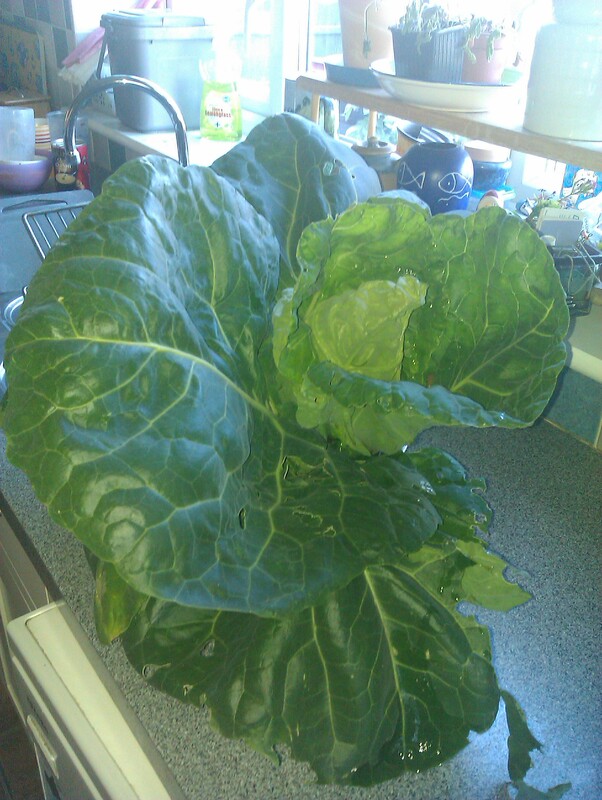 It never ceases to amaze me just how miraculous it feels to grow, cut and eat your own vegetables. I know I am not naturally ‘green fingered’ and I don’t honestly know that much about gardening, but I am learning by trial and error. I love the fact that the earth is generally so forgiving. I know that to get ‘perfect’ show specimens it is probably wise to follow the rules, whatever they may be, but there is so much joy in having planted those little plug plants of cabbage, weedy as they looked and now to have big green plants and eat them! Because it is a sign of Spring. Because it is beautiful. Because it is bright. And yellow as sunshine. Because it is. Well after last weeks bingey blip I am H.A.P.P.Y to report a Loss. In fact I have lost the 2 lbs I put on PLUS 2 lbs which takes me under the ‘next’ stone. Yes! I was worried at the end of last week that I would let things slip. Sometimes it’s so easy to have a bad day or two and then think, to hell with it and let it all go. Well lets say that has often been my dieting history. Very addictive behaviour n’est ce pas? So a good thing I am finding is that I am learning to encourage my little addictive self to get on board in a good way here. So I encourage her to do the research ( she LOVES that), get all the ducks in a row as to what is good to eat. She likes planning and being in control so getting to decide what the menu will be for the week, packing lunches and planning dinners suits her obsessive traits. And then I need to be the gentle adult, the nurturing parent ( Thank you T.A) and encourage my inner couch potato to do some exercise. So taking the dog for a walk every evening this week has been good. The missus and I go together which is a great way to let go of the tensions of the day, get some fresh air and be together and laugh at the dog playing. The days I was off work I took him for a walk in the daytime and we explored 2 new parks, that satisfies me on a lot of levels. I got back to Aquafit this week and went to the gym a couple of times too for some weights and cardio. And it felt good. My main issue is getting out of the door or off the sofa. I totally see the point now of a gym buddy. Luckily for me, mine lives here too so we can give each other a shove. Food wise this week I have made loads of salads. 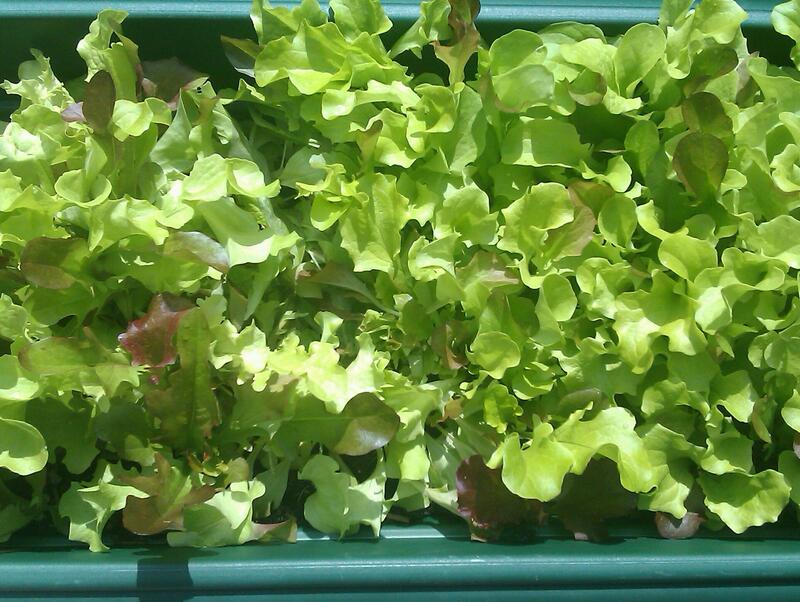 It’s the right time of year for it, plus our very own lettuce is ready to eat and I just love eating our own food, there is nothing better. So salads have been lettuce, tomatoes, cucumber, beetroot, green and red peppers, courgettes , mushrooms and any other veggies that look good/are in the fridge. I think the key is to have plenty of body and crunch in there. Just lettuce doesn’t cut it as a satisfying vegetable that will fill you up. You need some substance in there. This week I think we’ll add some grated cabbage and carrot. Lovely tiny new potatoes are everywhere right now so they have been in there too. At night for dinner we’ve eaten fish several times, red meat once, vegetarian sausage once and chicken. I know if I eat oily fish more it helps with the weight loss and its great for all those Omegas. So we’ve had smoked mackerel in lunch boxes and salmon at night. I am feeling pretty happy with myself. A couple of people at work have commented nicely that I’ve lost weight and I was able to be gracious and say ‘Thank you for noticing’ instead of just shrugging it off. I am finding that being open about the fact that I’m working on losing weight is a good thing not a secret shame. Thanks for checking in with me, blogging about it helps too and knowing you’re out there rooting for me! Rhubarb makes a come back! 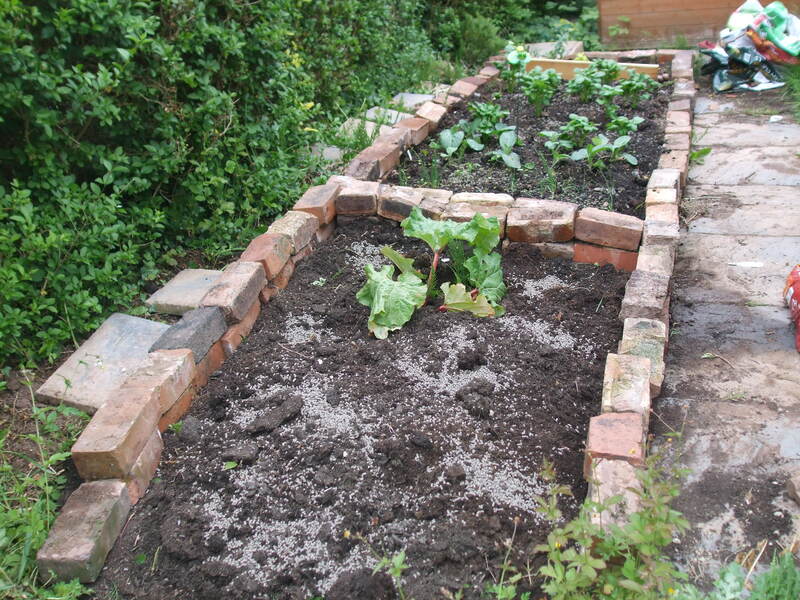 The vegetable patch is coming on, this year I’m growing some veg I haven’t tried before. 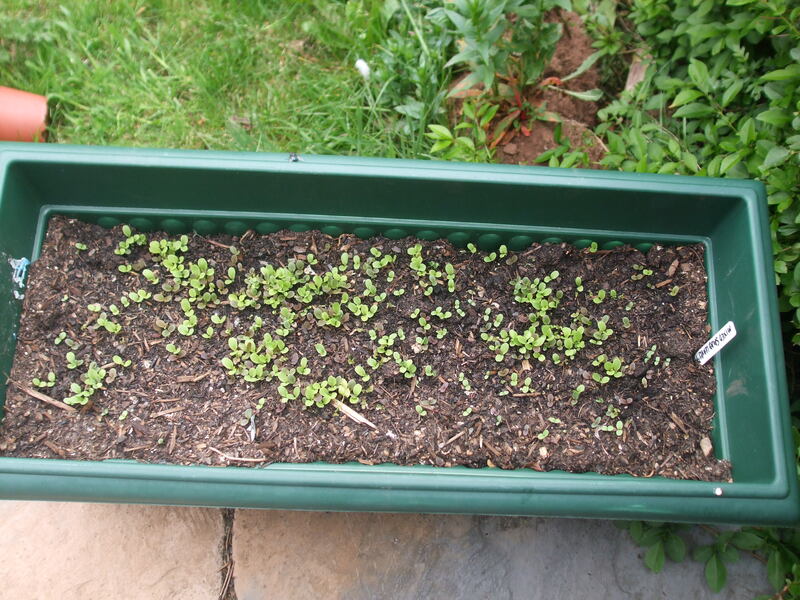 Last year I grew in pots on the patio until I coud get a patch of land clear so this year we have space for potatoes, spring cabbage and onions in one plot. 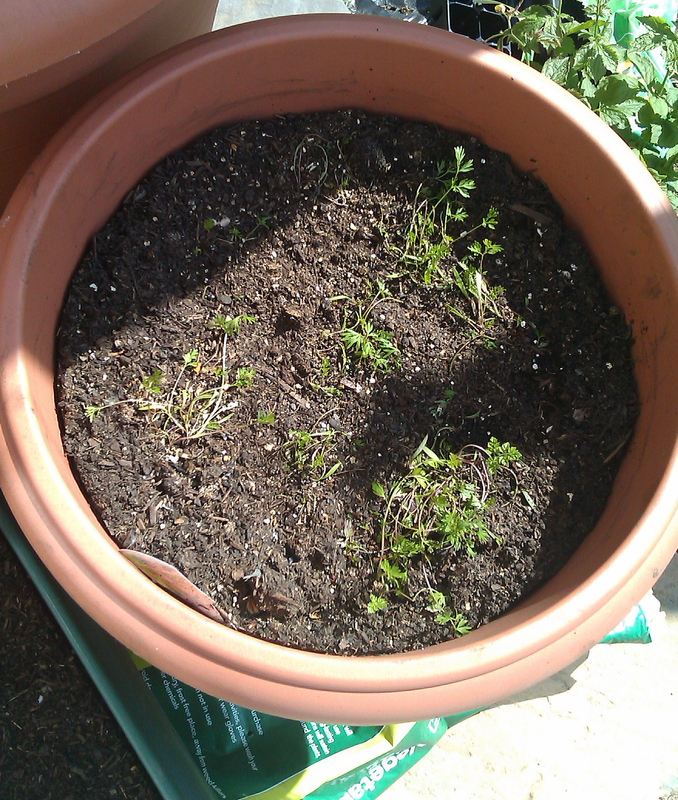 Some herbs in the smaller bit – feverfew, mint and chives so far. 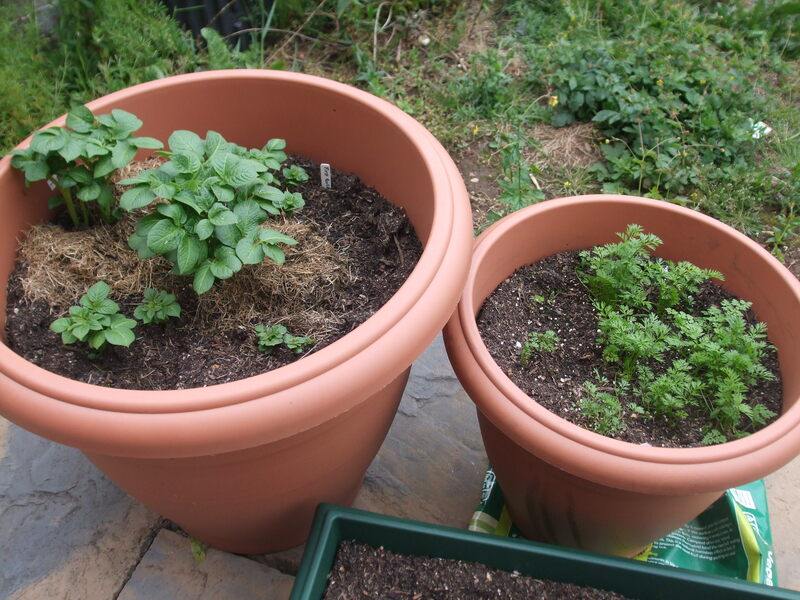 I have another big pot with potatoes, one with carrots and some salad leaves and beetroot in others. 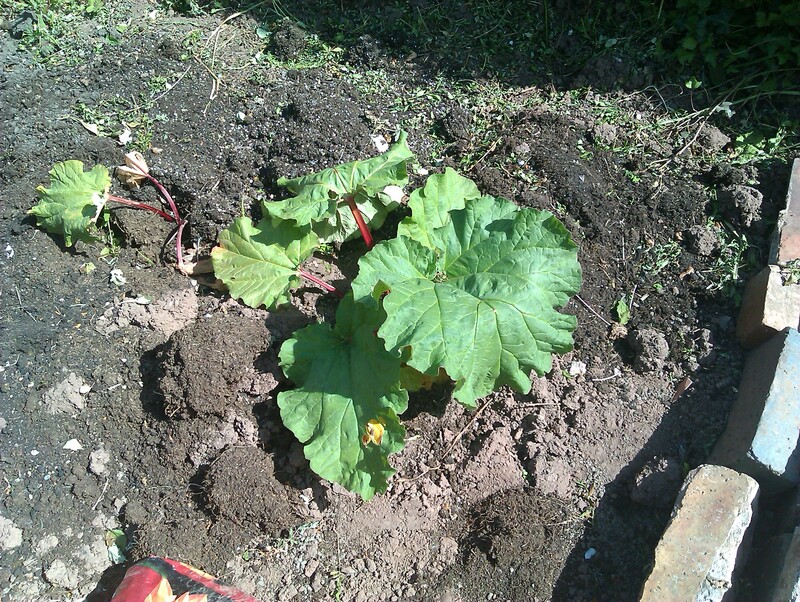 Still to be sown are yellow and green courgettes ( got to get going with them!) 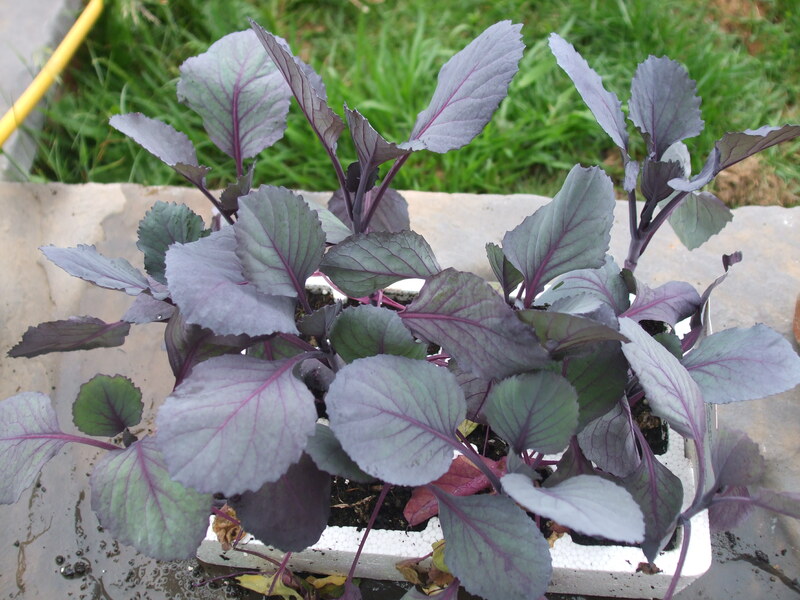 and some red cabbage plants all ready to grow on. 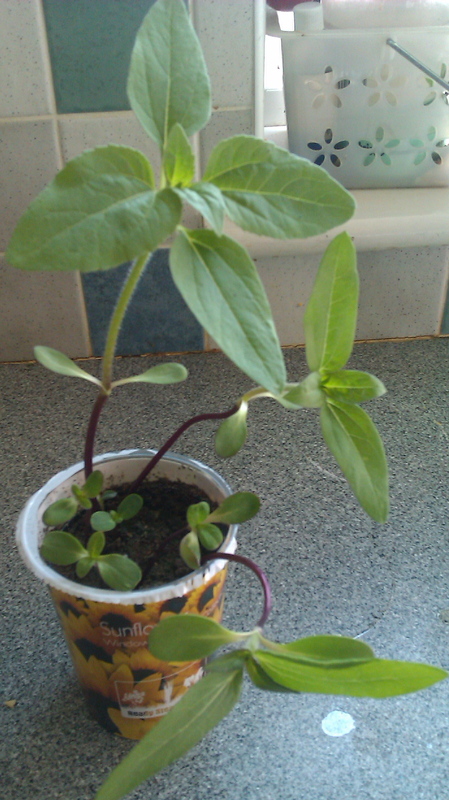 I’ve been growing sunflower seeds on the windowsill just for fun, look how fast they grew! Now to find a nice sunny spot by the hedge for them to be planted out and hopefully wave their sunny faces at us. The seeds will be a treat for the birds later on. 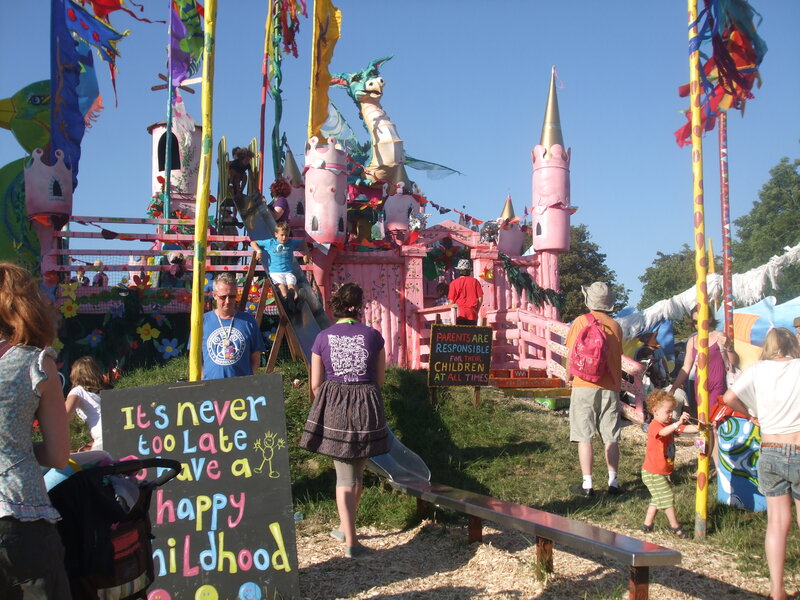 If you are in the UK check it out. 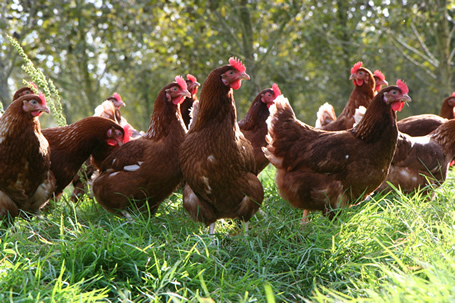 The British Hen Welfare Trust re-home ex-battery hens and give them a whole new life. They may arrive looking tatty, feather-less and somewhat the worse for wear but they soon settle in, grow new plumage and become part of the famil. That is my plan anyway. I just have to sort a good home for them first. And just think of all that free chicken poo! And lastly – what is yet to come! 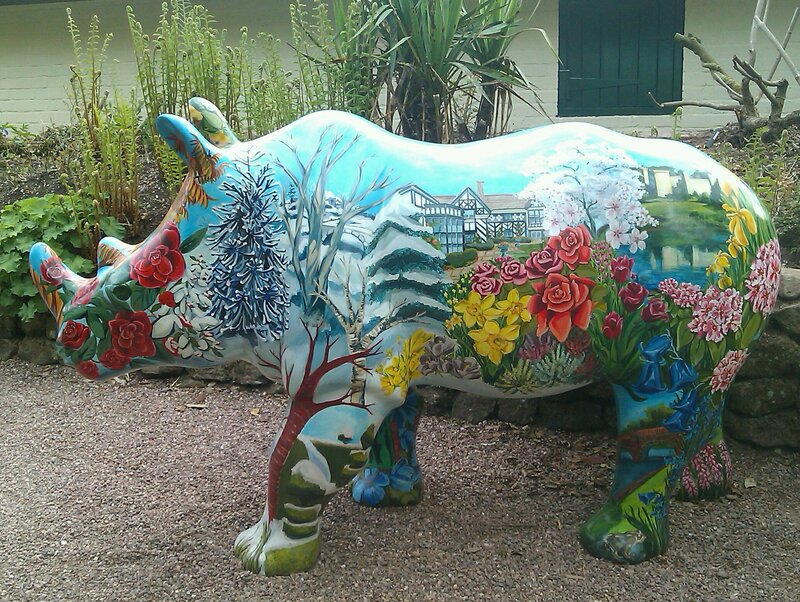 There is the untamed wild / wildlife upper part of the garden. I didn’t get to the dandelion heads in time before the wind last weekend so we will have another bumper yellow crop in next years grass I’m sure 😦 Longer term we have plans to have a greenhouse on here. Not too big, but somewhere to grow seeds and tomatoes and maybe a few more exotic things like peppers and cucumber. We have a load of old paving stones which I will start putting down later in the summer as a hard standing base. Then all we have to do is ave up for the greenhouse or hopefully find one on freecycle! There is something about being in the garden and growing things that gets under your skin and into your blood. My ‘gatherer’ nature emerges as I see the seeds begin to sprout and green shoots appear out of blank brown earth. It is good for the soul. 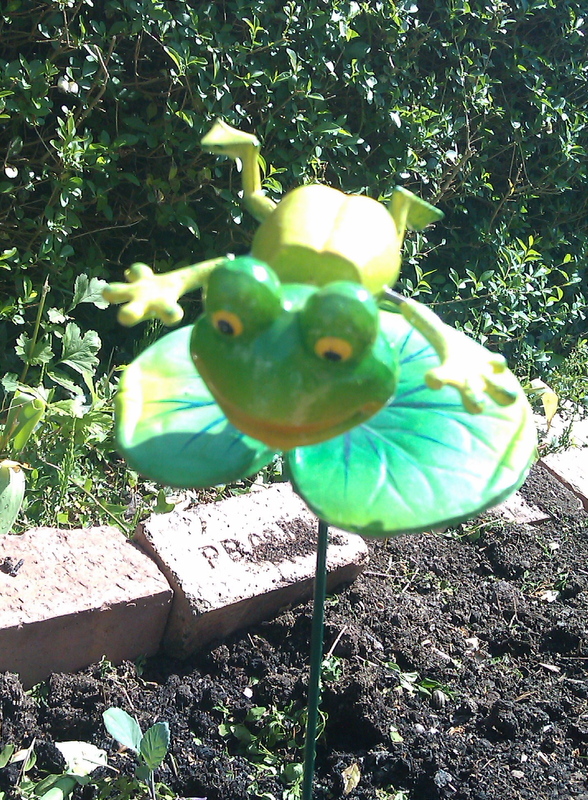 And here is froggy who is bouncing up and down and keeping a beady eye on my cabbages. 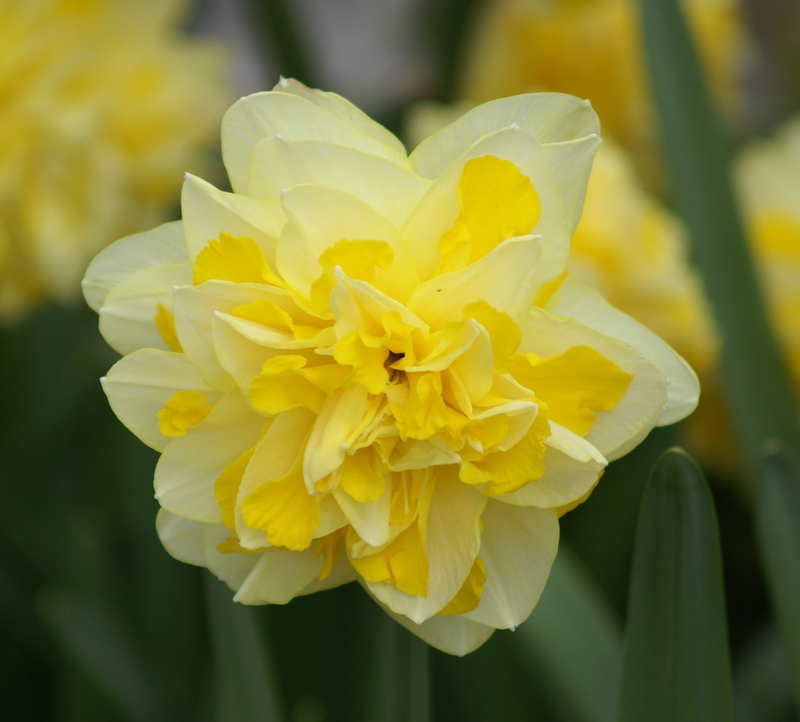 Nothing makes my heart sing quite like flowers.And spring flowers are the best of all. The reminder of hope after winter. The touch of warm sun and the scent of newly mown grass for the first time. I love looking at other people’s gardens, whether on a walk through the neighbourhood or by visiting formal gardens to walk and wonder and take photos. Azaleas are out now and the scent is sweet and heavy on the air. I buried my head in white lilac too and just drank in the essence of it. 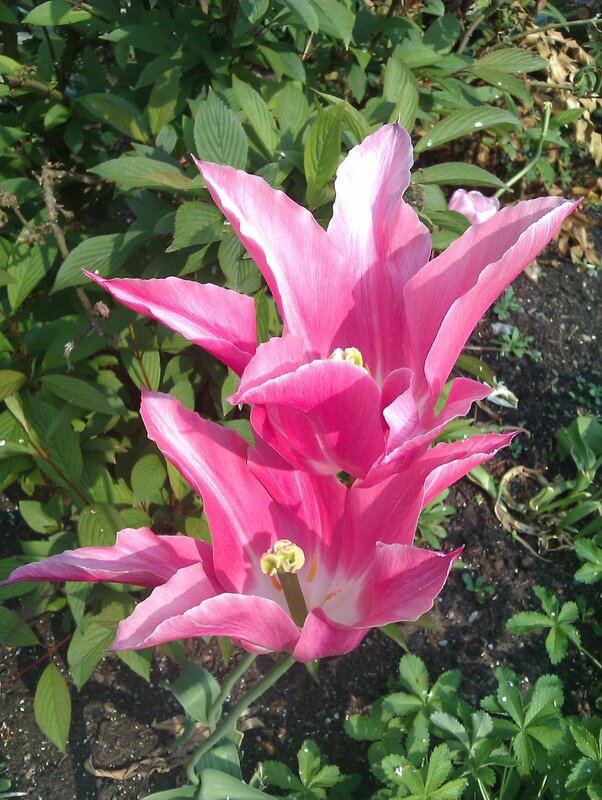 Tulips are coming to the end now but the last blowsy exotic petals fall downwards so that the flowers look like designer ‘fascinators’ all ready for a smart wedding. 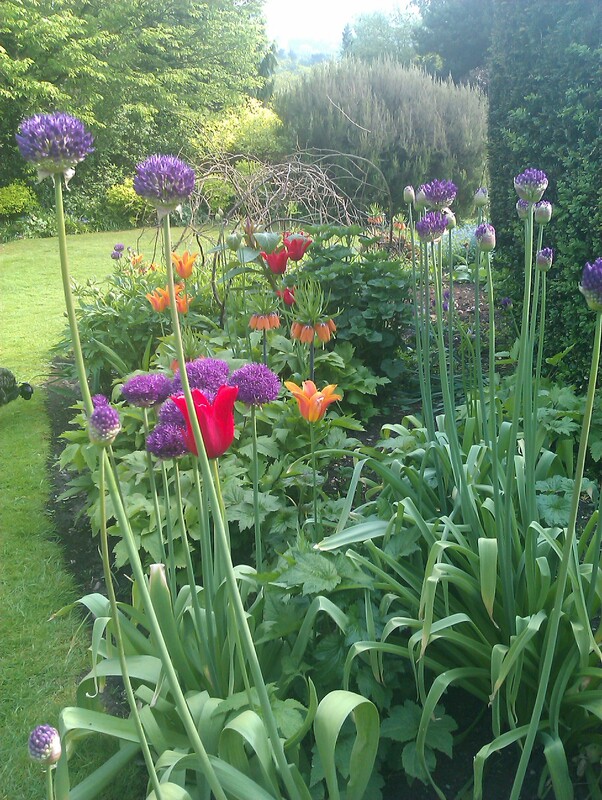 Huge purple globes from giant chives make me stop and stare, oh I have to find some of those for our garden this year! 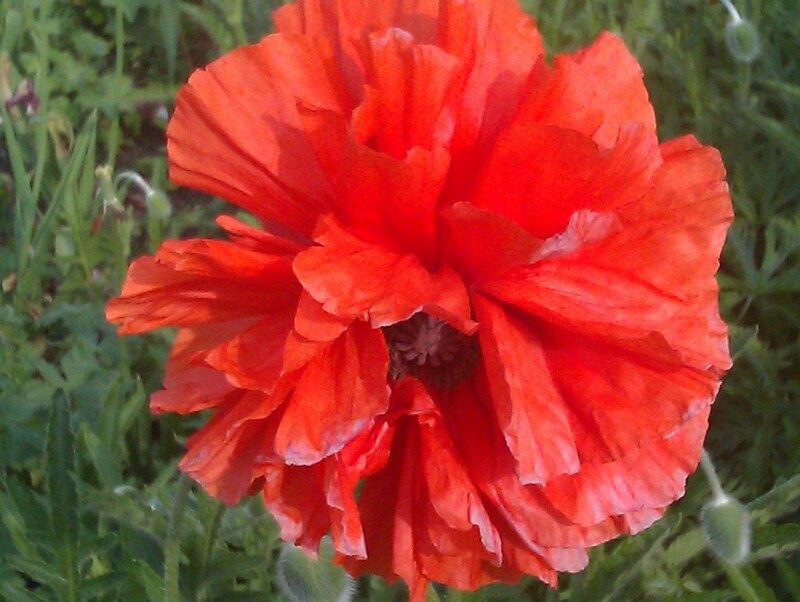 Poppies are bursting their buds, eager for it to be summer, fooled by the unseasonal warmth. 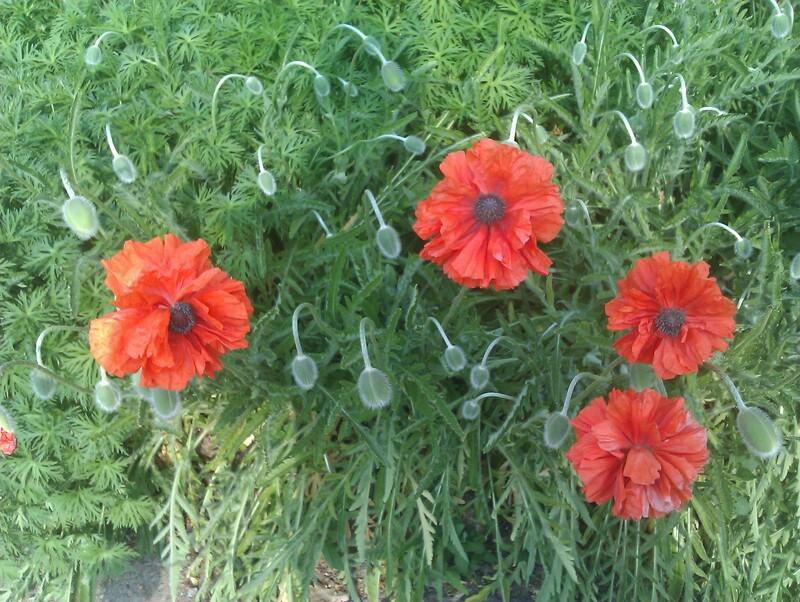 Giant Californian poppies with gorgeous red petals so lush and vibrant you wonder if they are real. Small field poppies in red and orange and yellow, their delicate tissue paper heads bouncing and fluttering in the breeze. 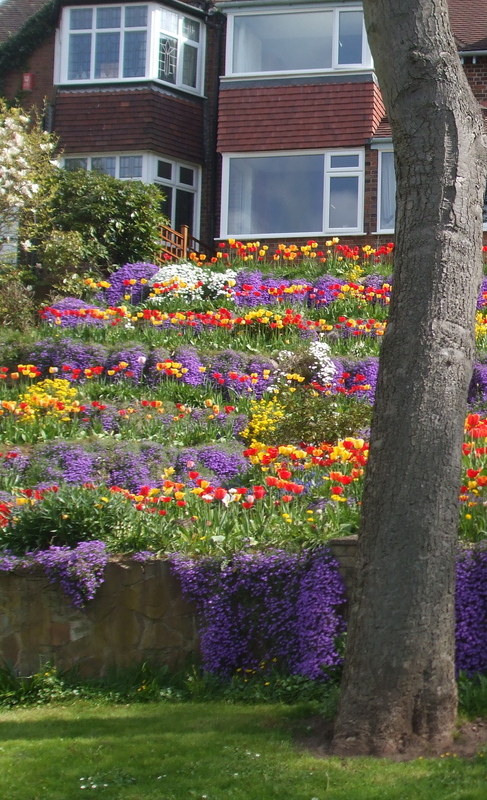 Delicious herbaceous borders planted with an eye for colour and design that makes me smile with admiration and awe. Part of the joy of other people’s planting is stealing ideas and inspiration. 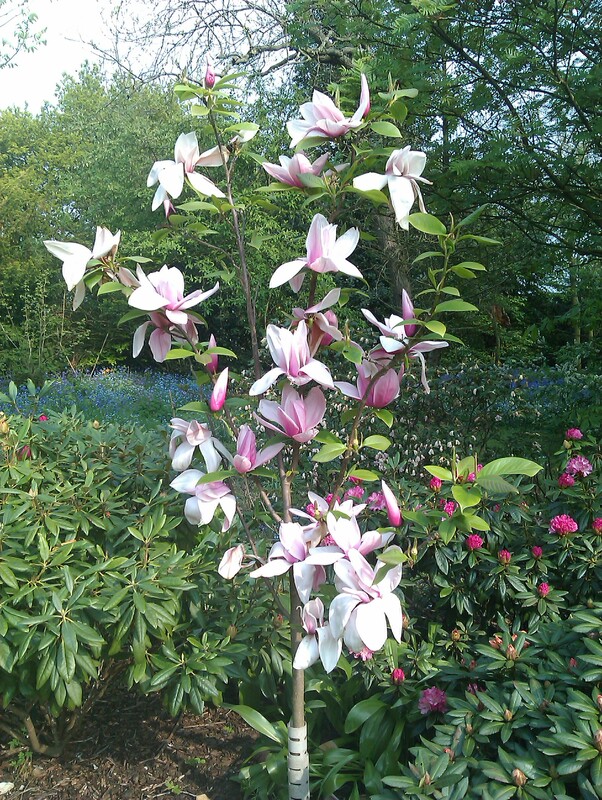 Magnolias have blossomed everywhere it seems this spring. They seem far too exotic to grace our urban streets but there they are, in ordinary front gardens, bringing a splash of summer. 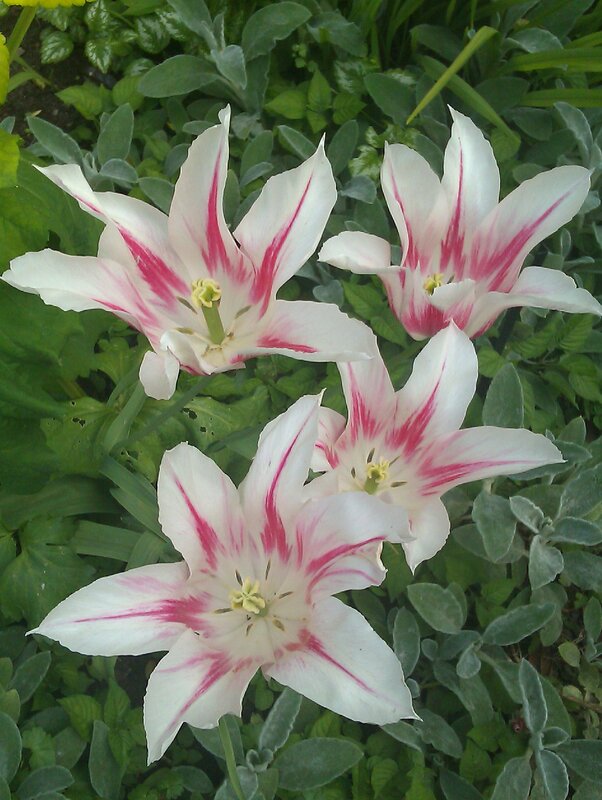 Now they, like the tulips, are at the end of their flowering and even more beautiful as they fade. They become like a different flower so I have to get close to make sure they are the same.